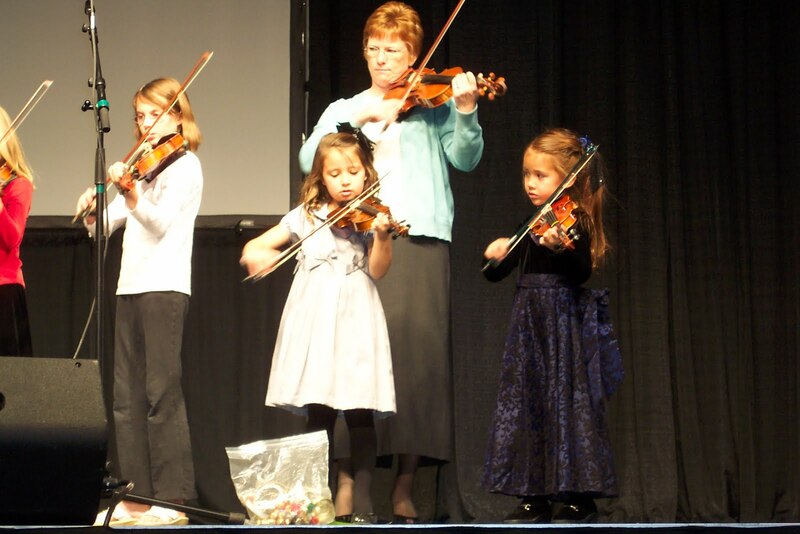 Tonight my charges are performing with their violin group at The Jubilee of Trees. It's their first Christmas performance of the season. Sailor will take it in stride. 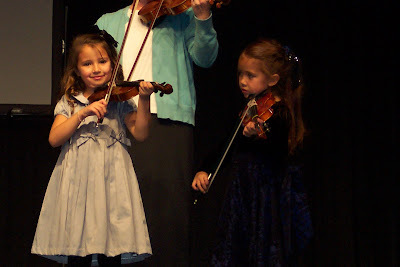 She'll march up on stage and play her little heart out. I can sit in the audience and feel perfectly at ease. But then there is West. And with West you never know for sure what you will get. Sometimes he is confident, dashing and bold. And other times he is shy, timorous, and wary. And when that happens, he likes me to be on stage with him. Right behind him, so close that we are touching. I understand this sentiment. Once my mother had to stand behind me with her hand on my shoulder while I accompanied a play on the piano. But the piano is big and bulky, and my mother who is roughly the size of large cat could easily hide behind. 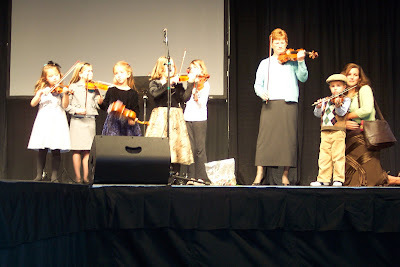 And I am left on stage, with only a child's size violin as my fig-leaf cover. This makes your old Prudy feel a bit awkward, kind of like the big and bulky piano she wishes she could hide behind. So, I am hoping and praying that tonight West will be feeling daring and fearless. But if he doesn't, I'll be right behind him. I'm his mother. Be back later tonight with that Apple Pie in a Brown Bag (for cousin Julie and my reader Lucky) and a report on West's performance anxiety or un-anxiety. And have you voted at French's? Time is almost up! Just a few more days for me to be a nagging nuisance. I'll miss it when it's done. It reminds me of Alyssa's first day of preschool. The kids all formed a train and toured their new school together. Alyssa refused to join in unless I accompanied her. I felt ridiculous and all the parents were giggling as I choo-chooed my way around. I was cracking up at the fig leaf reference, I totally know how you feel. I am also laughing about you describing your mother as roughly the size of a large cat. So funny! It really is sweet to see you up there supporting West, but here's hoping you can do it with a thumbs up and a smile tonight rather than a fig leaf. Good Luck to the kiddo's. They will do wonderful, you standing there or not :) That is such a precious story. This post is so sweet!! Such a good example of what being a mother means. I am also cracking up about you comparing the size of your mom to that of a large cat, too funny!!! I loved the picture of you and West so close together. This post was really funny Prudy. You had me laughing out loud at the cat reference about mom and the fig leaf cover. It really was so funny. What is it about big stages that make every part of me feel bigger too? My nose, my hair, my lower quadrant. You would think a big stage would make me smaller but no! Oh well. 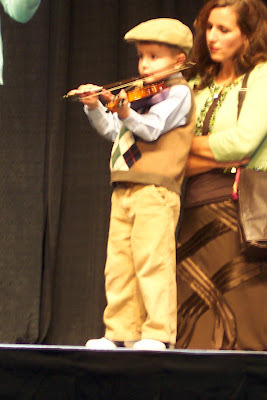 Luckily I have kept my on stage moments in my life to a minimum. I'm sorry your West needs you on stage but it really is so nice and kind of you. Thanks for the recipes from the last post. I can't wait to have all of those delicious smells in my kitchen. Thanks Prudy and break a leg! I was laughing just reading this post, and then I saw the picture of you KNEELING behind West with your purse! Erin that made me laugh so hard! I could just picture the whole thing, and you kneeling to make yourself less conspicuous. Oh, this one was very, very funnny. I love that with West you never know what you're getting. Is it confident West, or Nervous West? I bet Shane is so glad it's you who has to offer moral support on stage, and dance with scarecrows. Oh, please post some more posts and pictures like this. I think this was my favorite one! Hope all went well. Such cute kids and so talented. oh, how i love you. oh, how i miss you. whenever one of your posts make me laugh like this one did, i long for the old days when we giggled so much together. except instead of the old days, i want our grown-up selves with all these precious kiddos, but living in MUCH CLOSER PROXIMITY. sigh.